Hideki Nagaishi: Could I hear the story of STUDIO 4°C after the completion of the Mind Game project? Eiko Tanaka: The story goes back to one year before Mind Game. We released The Animatrix (2003). Thanks to the fame of Katsuhiro Otomo’s AKIRA throughout the world, the film MEMORIES, which we developed, also got attention from people all over the world. The producer of The Matrix (1999), Joel Silver, and the directors, Lana Wachowski and Lilly Wachowski, watched MEMORIES and thought, “We want to know the company that made such great images of the film!” Then, they visited Japan to tour STUDIO 4°C and that lead to the conversation to make The Animatrix together. Fortunately, STUDIO 4°C has been able to work together with many talented creators to develop all the titles the studio has ever created. So, we have aimed to prepare the best environment we can to enable them to fulfill their greatest potential, and it ends up developing into good animation. After we completed a title, it could catch many people’s attention and that connects to the opportunity of our new project. Our work markets itself, which happens over and over, and it has made STUDIO 4°C what we are today. Specifically, after The Animatrix sets off its journey to the global audience, we could receive various business offers from people around the world who watched it. Thanks to those offers, we could make an anthology film, Batman Gotham Knight (2008), and a DTV titled Green Lantern: Emerald Knights (2011), and ThunderCats (2011), a TV series, together with an American company Warner Bros. Animation. We also had good outcomes from them, such as an animated feature, First Squad The Moment Of Truth (2009), which we developed with Molot Entertainment from Russia, and an anthology film titled Halo Legends (2010), which is based on Microsoft’s very famous video game franchise. We sent a director or an animation director to all those projects, and we did our best to develop high-quality animation that exhibits our unique visual style. The number of people outside of Japan who are looking forward to watching our new titles is now not so few, so when I go abroad and hear their kind and warm voices for our works, that supports STUDIO 4°C and me a lot. Hideki Nagaishi: Are there any difference in business conversations you have as a producer between a Japanese domestic project and an international co-production project? Eiko Tanaka: Regarding to First Squad The Moment Of Truth, an international co-production project with Russia, I produced it with two Russian producers, Misha Shprits and Aljosha Klimov, and their bargaining ability was surprising. I think the most important thing for business negotiations is the same as everywhere else in the world, generally. It is that a producer falls in love with the project, and passionately conveys to the potential business partner things such as how fantastic the story is, what about the title that is so interesting and attractive, and how great the creators will develop it. Hideki Nagaishi: The number of co-production animation projects among different countries and cultures is high nowadays, so your successful experiences can be very useful references for those kinds of international projects. Eiko Tanaka: When you make animation via international co-production, you would face a problem of you and your co-production partner not understanding each other during the beginning of the project, which arises from cultural differences. If you develop the animation without understanding those things, the story could not possibly have good structure, and it would become an animation where the audience can’t make out what the animation conveys. For instance, if we run an international co-production animation project with an American company, and the American team makes a request for us, such as: “This should be a funny scene, but the animation as it stands now cannot make the audience laugh, because the timing is off. So, please correct it”. It would be impossible for us to correct the animation accurately if a certain timing for a scene is not funny for the Japanese, whilst Americans roar with laughter at it, and Japanese creators can’t understand why. If the Japanese team replies, “We can’t understand the reason why that timing is funny to you, but we will fix this scene according to your instructions to comply with your request”, it would mean that the creators will draw something they don’t know and understand. It won’t be a good product. If creators on the Japanese side can understand sufficiently about the reason why that timing is funny for an American audience, they could propose their own idea for a revision, by utilizing the Japanese’s perspective on American humor. For example, a Japanese creator could reply: “I see. That point is funny for Americans. Then, I will modify the scene like this”. Hence, when STUDIO 4°C faces a situation where we can’t comprehend the American co-production partner’s intentions due to cultural differences, we only start drawing after we understand each other over discussing it completely. So, when STUDIO 4°C does an international co-production, we state clearly in our first contract that we draw only what our Japanese creators can understand before starting the project, and we use the Japanese to develop the animation. We prepare everything in Japanese, which Japanese creators would use as the reference in drawing the animation, such as the scenario and storyboard. 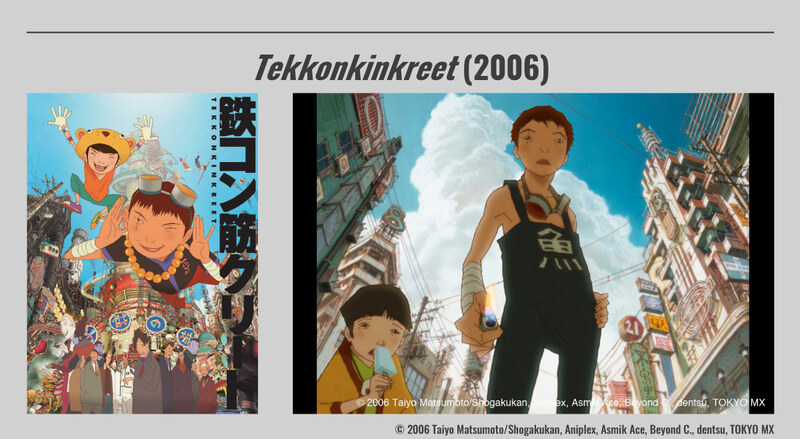 Eiko Tanaka: Let’s return to the story of our project after Mind Game, Tekkonkinkreet (2006). Just around the time we were starting the production of MEMORIES, I read the first episode of the original Manga series of Tekkonkinkreet written and drawn by Taiyo Matsumoto on a weekly Manga magazine, Big Comic Spirits (Shogakukan Inc.), and intuition had told me: “If this Manga story will be animated, the animation studio that will develop it should be us, STUDIO 4°C”. At that time, he had no experience directing animation, but I decided to take the challenge in making a development team with Michael as the director. We focused on gathering the type of creators who can show their ability well by teaming up with Michael, and we ended up developing a really good creative team for the film. Everyone did great work, including Hiroaki Ando, the co-director, Shojiro Nishimi, the supervising animation director and the character designer, and Shinji Kimura, the background art director. When Michael hits a wall and says, “I can’t understand this well”, everyone supports him like say “Ok, ok, don’t worry. We will be able to manage that”. With that, we completed the film.